Fill in your details below and we will let you know within 24 hours if we can get Chronicles of Crime: Noir to you with haste! You are Sam Spader, a private eye willing to find the truth—for whoever is paying. However, post-war Los Angeles is not always a friendly place. In the shadows, under the bright California sun, you’ll find Hollywood scandals, corrupt cops, merciless gangsters, blackmail, and murder. Watch your back, detective. 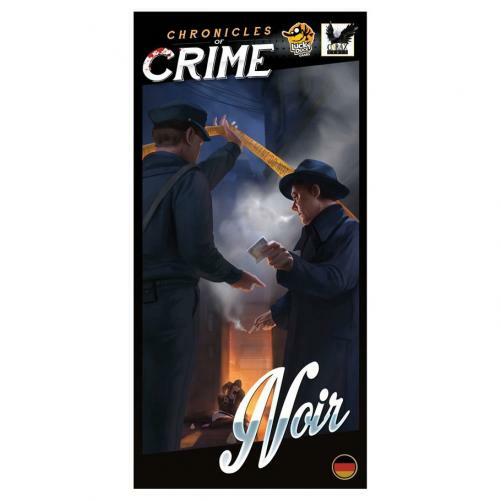 In Noir, the first expansion for Chronicles of Crime, the whole group is collectively representing one private detective with unconventional methods. Instead of Forensic Contacts, players have four action cards they can use at any point in the game: Spy, Break-In, Bribe, and Intimidate. But beware, you won’t be able to intimidate everyone without repercussions, and you’re short on money, so you can’t bribe everyone you meet. Play it cool, and you just might learn all of the secrets.